MMLT is offering a new Discover the Wild event series this year and we kicked off the season on Earth Day with Discover the Lowdown on Dirt, which couldn’t be more appropriate. It’s that time of year, just when the snow is beginning to melt away, when we’re ordering our seeds and thinking about getting our hands in the soil once again. Even if you’re not a gardener you may have wondered why certain trees just won’t grow on certain parts of your property or why some areas don’t drain very well. 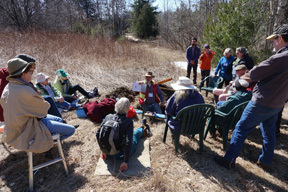 This opportunity to learn all about soils was offered at High Lonesome Nature Reserve on Sunday, April 22nd by David Kroetsch who is a retired Soil Landscape Scientist (Pedologist). He specialized in the identification, characterization, description, classification, and mapping of soils in their natural landscape positions in all regions of Canada. 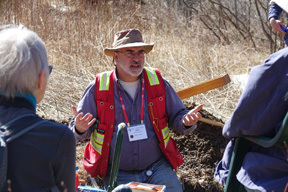 David also has been involved in soil education for many years and is an Adjunct Professor in the School of Environmental Science at the University of Guelph where he has assisted in the development and instruction of a Graduate Field course. David was also a member of the team that developed and instructed a course for Provincial Ecological Landscape classification for the Ministry of Natural Resources. High Lonesome is one of seven nature reserves managed by the Land Trust. It is located in the Pakenham hills and offers 8 km of trails that wind through meadows, around beaver ponds and through forest glades. It’s open to the public year ’round and each season brings its own special highlights. A map is provided below for your convenience.